I'm searching for my humour and wit. I can't even squeeze out some sarcasm! I want to do a Christmas post - but I'm stuck. I'm having trouble finding the Christmas spirit. I enjoyed shopping for Christmas gifts...especially for our nieces and nephew. I was a Barbie girl - and so are R&R! I can't wait for Jason to open his gifts, and I would love to see R&R open theirs. I remember my "Best Barbie" Christmas, and I hope that someday they have "Best Christmas" memories. 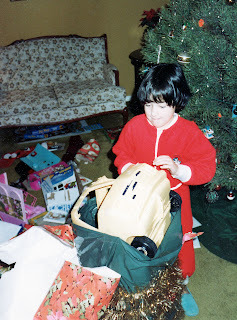 One of my most memorable Christmas mornings: opening up the Barbie Camper! Potato Bread is a family tradition - going back to Ladyfingers days as a girl. It is often reserved for Christmas and Easter breakfasts- and now, when the family comes together as a whole. It's a treat! I've decorated the Christmas tree. We have new ornaments and new lights. I've carefully hung each ornament, admiring and remembering the story with each one. And even if there isn't a story, I have a fondness for each ball (or handmade dog face!) on the tree. So why is it that I am without spirit? Or am I? Maybe I am expecting too much and looking too hard. December 24, 2009 at 9:14 a.m. The Christmas Spirit is alive Emily. Posting your pics means that you have it. As we age the spirit changes but it is always there in some form; traditions that we repeat for instance, like the Irish potato bread.Perhaps it is the excitement of childhood you are searching for. Yes, children opening gifts is exciting but there is a whole other happy feeling in bringing a smile to the face of someone in pain or giving to someone who has nothing.D. & I experienced the best Christmas Spirit we've ever had 2 yrs. ago when we were alone & went to visit people in the hospital on Christmas day. They were all very sick but we brought a smile to their faces when we walked in with shortbread, tea & a crib board. It was there with the gift of song to a Nursing Home when you were a Brownie, when you played the recorder at Grandma's seniors centre, carrying the baby Jesus to the manger at church (yes you were nervous but you brought smiles to the whole congregation) The birth of Christ can be celebrated in many ways. The spirit is alive, you just have to look for it. December 24, 2009 at 1:34 p.m.
Perhaps you ARE looking too hard. 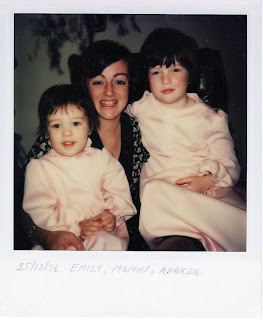 I think that you are missing your family & that is a very real feeling, not to be confused with the lack of Spirit. You are also grieving your recent news about not being able to bear children. It is hard to feel the Christmas Spirit when you are grieving. So much of the "spirit" focuses around children. I share your pain & pray that it will take it's course soon. Lots of love to you & Jason.